I carved the turkey this year. What fun. I love wielding the electric knife and I sneak the best pieces to those helping out in the kitchen. The entire process this year had an added element. My 11 year old nephew, Max, insisted that he help out. He kept pushing his way in, trying to disarm me. I explained to him that nobody in the house felt like spending the evening in the emergency room watching him have a finger sewn back on. His retort was that grandpa told him it was ok. What an enabler! My father has an unusually large soft spot for Max, which has not been lost on this very smart kid. He has been known to tell people that grandpa is his friend and will let him do whatever he wants. Here is the incongruity. On the one hand, Max wants to handle a potentially dangerous utensil. On the other hand, he still asks me for an “airplane” (you know, when you lie on your back with your legs up and the child puts their stomach on your feet and flies), which I have been doing since he was 2. Needless to say, I did not hand over the knife. Some background: My sister is a finicky eater. She is so fussy, in fact, that picky eaters tell her she is a picky eater. When she showed up at my parents, I saw her slip a container of veggies in to the fridge. She commented that it was leftover lunch. Dinner was set up buffet style in the kitchen. My mom presented us with a stupendous meal. There was, of course, the turkey. She also made stuffing, potatoes, the best cranberry sauce I have ever tasted, green beans, squash, apricot and banana bread. In accordance with my sister’s aversion to meat, my mom tried hard to make enough accompaniments to keep her satisfied. We all piled our plates high with an assortment from the offerings. My sister, on the other hand, walked into the dining room with a plate filled with the veggies from the container, a conglomeration of peas, corn and lima beans and a few limp carrots for color. The veggies, fancily named succotash, had apparently been acquired at an up-scale LA deli, but they looked less appetizing than a can of Jolly Green Giant. I think the Giant would have cringed if he had witnessed the mess on that plate. The lifeless veggies were cause for much laughter and ridicule. 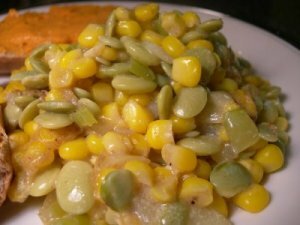 The irony, which was not lost on my sister, was that my mother had expressly called us both last week to inquire whether she should make succotash. We both replied that under no circumstances would we eat succotash, especially when there was so much other food. Well, sis. You lose! My grandparents are old. Eighty-seven and ninety. They are very independent and sharp as tacks. Their hearing has diminished, though, and time and gravity have taken their toll on their stature. My nephew asked my grandmother how much she has shrunk over the years (at her tallest she never stood five feet) and told the endocrinologist, who he recently saw to discuss his own height issues, that his shortness was his great-grandmother’s fault. My father, never one to shy away from a provocative discussion had not one, but two doozies at dinner. My grandmother is extremely fashionable. I have never seen her wear shoes that did not have at least a two inch heal. Usually, they are even higher. The first contentious conversation was about the shoes. My father insisted that my grandmother wear more sensible shoes because falls in the elderly are so common. The discussion was heated and I of course added in my two cents. I revealed that Nick Cannon bought his stiletto wearing and pregnant wife, Mariah Carey, 20 pairs of flats. As if that no-win battle wasn’t enough, my father then went on a tirade about elderly drivers. Both of my grandparents still drive and my grandfather even just had his driver’s license renewed. My father reasoned that the reaction time of most individuals over 80 is quite slow and that there is not proper testing of the elderly to determine if they are fit to drive. All salient arguments, but lost on my grandfather who steadfastly believes he is a very capable driver. It was suggested by someone that reaction time should be judged by performance at Whack-a-mole. But, let’s be real. Most of us would fail miserably at that task. My sister, brother-in-law, niece and nephew bolted at 8 to drive back to LA. The kids had an early swim practice the next morning, although neither of them was excited about it. Would you want to swim 3 hours? Do you have any stories to share from Thanksgiving?